Last year I traveled to Los Angeles on business in early March, and took an extra day to explore Iron Mountain. This year I had another opportunity to spend a day in the mountains above LA at one of the most congenial times of year for hiking in the high country. I really wanted to explore some of the airplane wrecks that I have read about on the Web (see Chris Killian's excellent page). I had my eye on Pallet Mountain, but this year's snowpack made that unattractive. 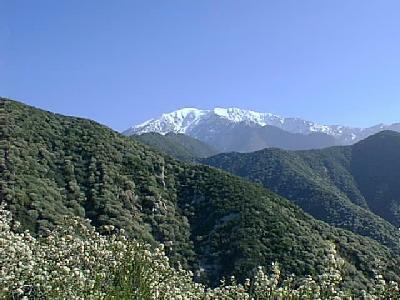 In fact, I am uncertain that I would have made it up Iron Mountain this year because of the snow. Inspired by Joel Grasmeyer and Bill Oliver, and by my own fond memories of visiting Allison Mine long ago, I made up my mind to hike there once more. 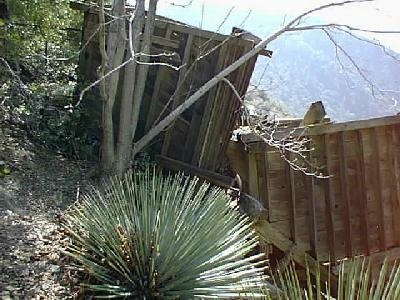 I had previously visited the mine twice, both aborted attempts on Iron Mountain, staying overnight in each case. One of those trips is described elsewhere. This time I was making it as a day-trip. I was determined to travel lighter, moving faster, to allow me to get back the same day. And this time I brought a flashlight, so that I could explore the diggings. I got an early start, but not so early as last year. That time I was determined to start at sunrise, requiring me to pass the parking permit station at 4:30 AM. Since no one was there I assumed I could not be held responsible for paying the parking fee. That erroneous assumption cast me $50. This time I got there as they were opening and paid my $3.00. 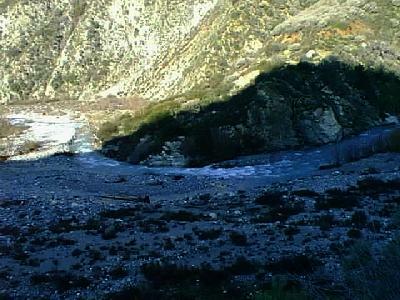 This picture is taken from the lower elevations of the Heaton Flat trail, of the San Gabriel River. The sun is still low in the east, casting a deep shadow on the river below, but the sun is bright and the weather is clear. The scale is not apparent from this photo, but the river looks to be about 20 feet wide, about 4 feet deep, and flowing very rapidly. I judge it to be very hazardous to cross, and promise myself I will stay well away from it. At this early hour, I see only one other car in the parking lot, belonging to some fishermen I meet a few minutes later. Reaching the ridge, I can see Mt. 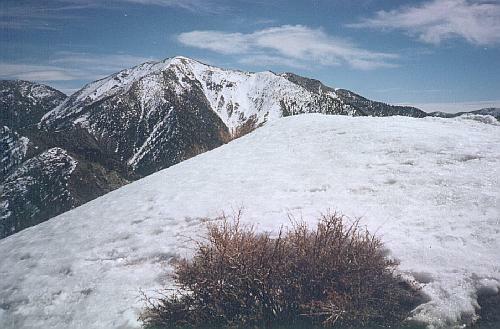 Baldy, covered in snow. Compare this to last year. The El Nino weather in California has meant lots of rain, so the hills look unusually green and the flowers are out. Actually, it did not seem much different than last year as I was hiking. 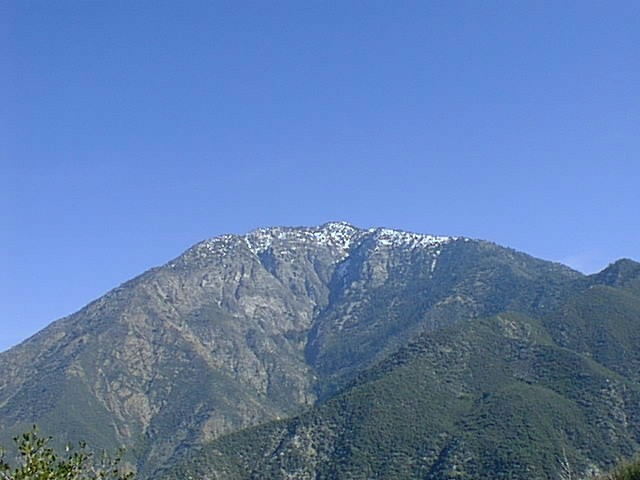 Again I looked up at Iron Mountain, at the end of the ridge. I had been informed that the snow line was at 4000 feet, but this picture of the 8000 foot peak makes clear that the snow was actually much higher than that in this area. 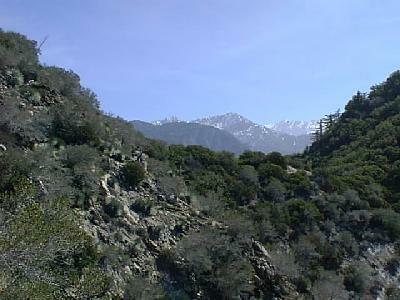 To get to Allison Mine, one hikes up to the ridge, than follows it towards Iron Mountain. At a prominent saddle, the "real" trail veers off to the right and the Allison Mine track takes off to the left. I had a lot of trouble finding the beginning of this trail, even though I was 100% sure of exactly where it should go. 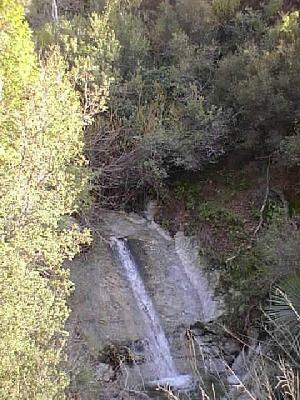 I went up and down the hillside looking for signs of a trail. When I finally found it, I turned around and took a picture of the saddle and surrounding terrain to help me remember. Do you see the trail ? 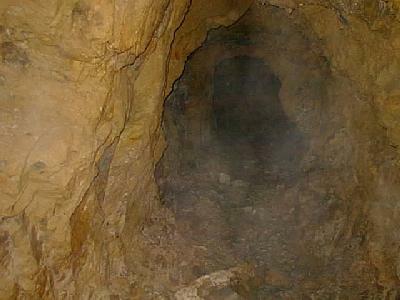 The whole length of the track from the saddle to the mine was an exercise in close observation and route-finding. The trail has been abandoned for many years, and is considerably more overgrown than I remember it was twenty years ago. 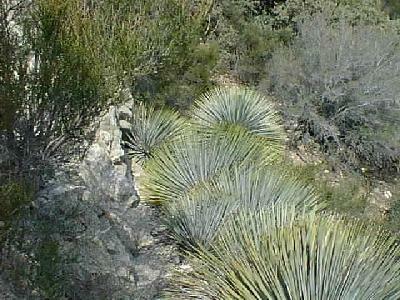 Furthermore, many sections are washed out, overgrown with yucca, or otherwise impassible. This is a sample of what the trail looked like. And the trail was actually a lot better than nothing. I don't know how anyone could get through the thick brush without cutting it away. Even so, the hillside is so steep in most areas that you cannot comfortably stand, but only hang on. Actually the construction of the trail was a remarkable achievement for a couple miners. There are many places that were cut out of the rock, and other places that were built up with elaborate rock walls. It is the washouts and the overgrown brush that make this trip difficult. I wish I had worn long pants -- my legs were really miserable by the time I got to the mine. 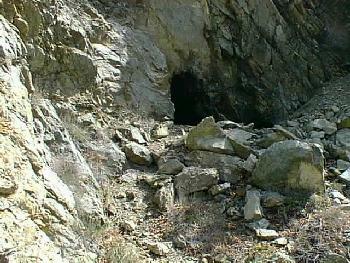 The mine itself has several entrances, on different levels. The picture on the left shows the main entrance. 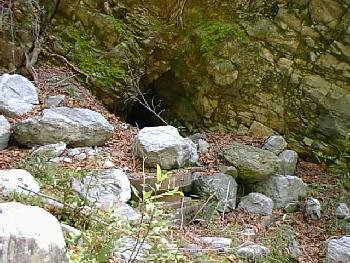 On the right is one of the lower tunnels, which has partly been filled by debris from flooding of the stream close by. Inside, the mine was generally five to six feet high in most places. I had a hard time seeing clearly because it was so dark. My eyes, used to the bright sun outside, never adapted very well to the dark. 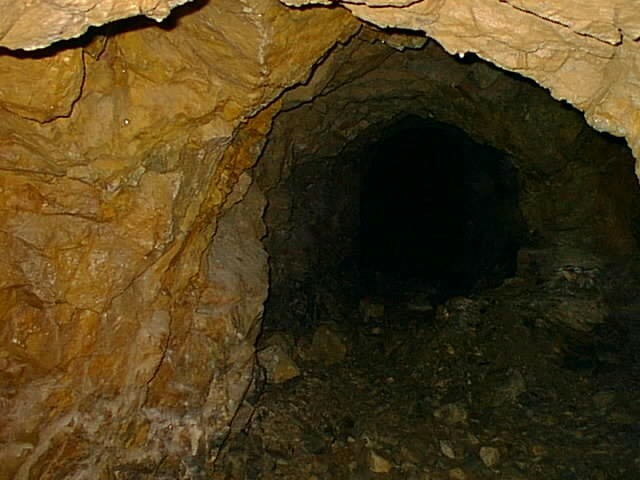 My flashlight never showed much more of the mine than you can see here. It was wet inside the mine -- water was dripping from the ceiling everywhere. It was cold in the mine too. Together this made fog, shown clearly in this (unretouched) photo. There were tunnels on at least three levels, and many of them branched and twisted around. There were a couple pits in the floor, and branches going straight up. A few passages were partly collapsed, and a few were to low to get through without crawling. In front of the main entrance is some old equipment. This is apparently an ore hopper, connected by some old rails to the mine entrance. There are water pipes and other equipment, leading to an old ball mill lower down in the canyon. Twenty years ago there had been two wooden shacks, with beds, cooking utensils, and other miscellaneous artifacts. I remember waiting out a downpour in one of these shacks. I did not see any sign of these any longer. I made the trip back the same way I came. I saw no one else on the trail until I got within a mile of the trailhead, even though this was a Sunday afternoon and the weather was glorious. The last part of the trail was especially enjoyable because all the little gullies had water -- the first time I have seen this. The full set of photos that I took on this trip are available. These pictures were taken with an Epson PC 500 digital camera. Earlier pictures on my web pages are scanned in from 35mm prints. After scanning, I typically adjust the color, crop the picture, and sharpen it up with various filters. The pictures on this page have not been modified except to reduce them in size. How do you judge the quality of these pictures, compared to others on my pages ?